Jay Root of the Texas Tribune has written an excellent article regarding the voluntary program to ‘save the lizard’. We had visions of oil companies, state government and environmentalists marching in lockstep, singing KumByYah in a holy struggle to save the lizard…..nothing could be farther from the truth. I did not think it possible to hold our local politicians in any lower esteem but I was wrong. Read this article. If the Fish and Wildlife department steps in, declares the lizard endangered and takes over the effort it will be good enough for the hacks (including Susan Combs) in state government, the oil companies that are busy trying to screw each other and those that supported this shameless effort to control who benefits and who doesn’t from ‘saving the lizard’. Those that long for secession take note. What your own state government can and is willing to do to you is as bad as what you believe the Federal ‘Gummint’ is capable of! 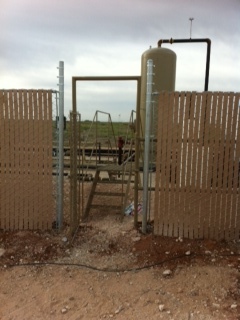 After our last post on the shoddy fence security of the tank battery we report that the fence has had some work done. The gates were shut and the 2.5 to 3 foot gap between the west gate endpost and the gate has been fixed. I was beginning to worry that Berry was only concerned that large, round people were the real security threat to their operation. Anyone over 350 lbs would have had a hard time squeezing in; clearly discriminatory. Apparently that was not true and somehow the gap was not noticed until we pointed it out. However, while the gates were shut they did not appear to have locks on them readily visible. Jeff Coyle of the KGB, if you come out to inspect please make sure that the gates are locked securely. This will require spending money on locks and keys but we think the safety of the people of Gardendale (not to mention your equipment) is worth it. If we can’t hold them accountable, you should. Calling all Texans! HB 3600 needs your support! Tomorrow, HB 3600 is being heard in the Energy Resources Committee in Austin. This bill helps to restore some of the gross inequities between the mineral owner and the surface owner. Contact your representative and ask them to support this bill. Jeff Coyle, curator of the CommonGroundGardendale website stated in a response that Berry was accountable to their stockholders, regulatory agencies and the citizens of Gardendale. As such, they did not need Gardap to be accountable to. Well Jeff, you may not need us to hold you accountable but you do need us to check on your security! Go close and lock the gate on the tank battery behind the Berry Scar. While you are at it why don’t you fix that 3 ft opening between an endpost and another gate! Cheesh!